When you have data for several years saved as Excel documents, transferring all the records to a DBF file is a pain. First of all, automatic exporting that Excel offers is far from ideal. And Excel 2013 cannot save dBase III and IV file format at all, it only reads them. Second, the complex structure of data often does not fit into the structure of a DBF file without manual adjustment. Third, the performance is not what you’d expect from a software giant. The solution? 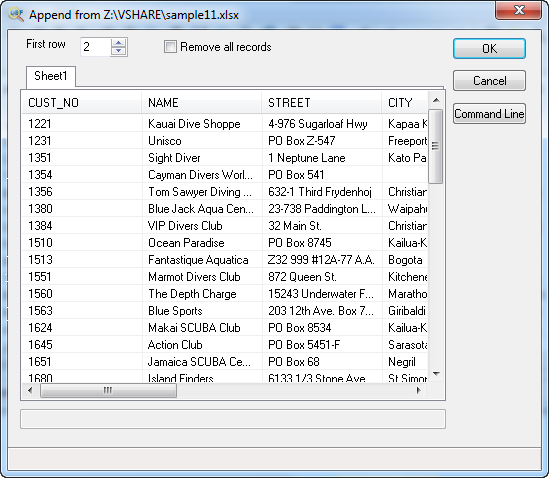 Try DBF Viewer 2000 to import data from Excel to DBF. The tool works faster, reads any XLS and XLSX documents and promptly imports information from them to the selected DBF file. Once you open the Excel file you want to import records from in DBF Viewer 2000, it scans the file and presents you a quick preview of all sheets in the document. The program detects field types and lengths automatically. In fact, the process is automated almost completely, so there’re no many options left. The “First row” option allows you to tell the program where the actual data start. This is handy, when the XLS document has a complex header. And the “Remove all records” option allows you to remove old records from file. Once, you are done, click OK and the data are imported to DBF.